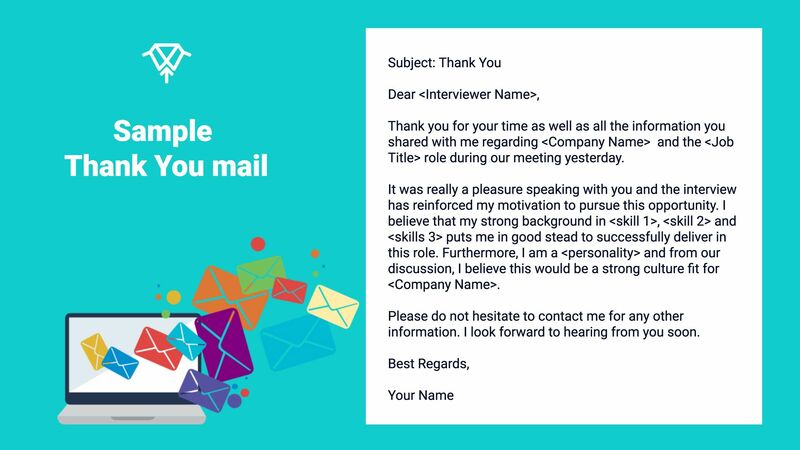 A post-interview thank you email is a common part of job search etiquette and a well written email has many advantages for the job seeker. It is a great way to reiterate your motivation for the role and summarise how your skills and qualifications could be attractive for the employer. It also is a fantastic way to stay on top of the recruiter’s mind and remind them why you could be a strong candidate for the role. Here are a few things to keep in mind when composing your post interview thank you email. It does not need to be complicated. A simple subject line such as ‘Thank You’ is enough and summarises the purpose of your email succinctly. Start by thanking the interviewer for their time in the first paragraph. Follow this up by reiterating your motivation for the role and briefly mentioning why you believe you are a strong fit for the role (it can’t just be because you are motivated to do it). Think back to the interview and identify the requirements/expectations that the interviewer had spoken about. Ideally, you should refer back to these in your email and summarise how you possess these skills or qualities. End by mentioning you are available in case they would like to clarify anything and that you look forward to hearing from them soon. It is best to send each interviewer a separate email post your interview. Typically, each interviewer tends to bring a slightly different perspective on the role and requirements. As a result, customizing your email by referring back to each conversation and establishing your fit from each perspective can help you get buy-in from more stakeholders. Review your email thoroughly before sending it out. There is nothing worse than a typo as that conveys that you don't take the role seriously enough to give more attention to your email. Also, after your draft is ready, edit it to convey your message as concisely and concretely as possible. No interviewer has time to read a long email. You are rarely alone in a recruiting process, so ideally, you should send your email within 12-24 hours of the meeting. Sending it too quickly after the meeting could indicate that you haven’t taken the opportunity to step back and think through the interview. Sending it post 24 hours on the other hand, can be risky, as your interview may no longer be fresh in their mind and they may have already taken a decision on the interviews. Videos to help your job search and career goals. Your dream job is just around the corner!